We told you last night about reader Erik, who logged on to StubHub and bought a $6 ticket (including $3 in fees!) for tomorrow night's World Series opener at Fenway. Yeah, well, StubHub has now let it be known the sale was "fraudulent" and that they've canceled Erik's purchase. 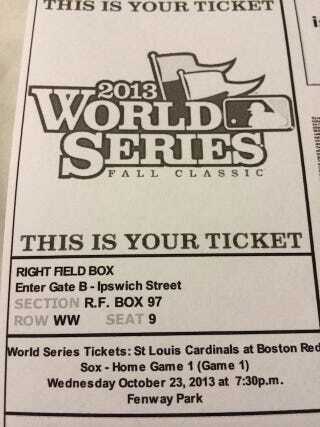 Apparently the seller contacted stub hub because I got an email saying they were canceling my $6 World Series ticket. Also I got a poorly worded voicemail saying that the ticket was fake and that I was protected by the fan protect guarantee. I'd get my 6 bucks back. Woohoo. I called stubhub and spent 41 min on the phone with them and spoke to 4 different people. The story changed to that the seller of the ticket had committed fraud. I really think that they just listed it wrong and complained and stubhub is acting so that they can get a large commission off of the ticket by reselling it for full price or something to that effect. I asked them to comp me a comparable ticket but they said there weren't any available. I said there were literally dozens of tickets in the same section or adjacent sections, but they refused saying they couldn't. After more time on the phone I finally got them to give me a $50 account credit. That's it. I'm pretty pissed because I was going to take 2 half days, fly wed to boston from Pittsburgh and back Thursday morning after the game.